While I think this adage is true, there’s no sense beating yourself up for not buying ten years ago. Maybe you weren’t sure you wanted to set down roots, or maybe you always intended to save more for a down payment, or maybe you were still in high school. Regardless of the reasons, you’ve still got the second best option available to you. Let’s talk about why it may be favorable for you to buy now. Most urgently, it’s that your purchasing power at this moment may be better than you realize, and better than it will be next year. Interest rates are lower than they’ve been in months, currently around 4.5% for a 30 year conventional loan. They’re expected to rise as 2019 continues and the Fed raises interest rates, which have an effect on mortgage interest. Adding to the urgency is the fact that most people’s income doesn’t grow 5% per year – the average increase in the Portland metro area in 2018 – so every year you wait to buy will effectively reduce your purchase power. As with many first-time buyers, your primary concern may be having enough down payment. The reality is that most of us don’t have 20% of the purchase price handy. But many don’t know that a plethora of lenders have first time buyer programs that don’t require much down, and it’s not just FHA loans that have this low cash-up-front requirement. Many companies have incentive programs that include low down payment amounts or closing cost credits. Talk with your Realtor who can give you a recommendation for lenders that specialize in catering to first time buyers. In addition, owning a home can help you build wealth… if you’re in it for the long term. 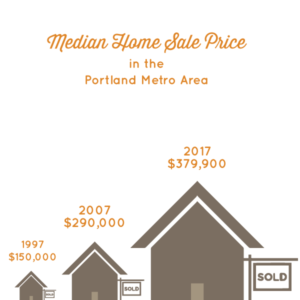 In the Portland area, even during the anomaly of the market crash in 2007, average home prices increased significantly in any given 10 year period. 2007 was the worst of the downturn in Portland. In September of that year our area’s median sales price dropped 6.7%, the largest single month reduction of the crisis. That year, median home prices were $290,000, but they were still far better than 1997’s median sales price of $150,000. Just like with the stock market, long term vision reduces the impact of volatility. It’s also another good reason not to wait to buy. We’ve been talking long term, but you don’t have to wait a decade for financial advantages. Given that you can still deduct your mortgage interest from your taxes (up to a mortgage amount of $750,000) but you can’t deduct your rent, this gives you a yearly incentive to stop saving, start buying, and put that tax refund right back into savings. Building that nest egg isn’t a thing your grandparents did, it’s happening all around you. Finally, as previously documented on this blog, winter is a fantastic time to buy. It’s the slow season, so with fewer buyers and increased inventory, you’re less likely to compete with other potential buyers when you write an offer. You may even be able to get into a new home in as little as five or six weeks from the start of your search. That ownership will bring increased housing stability into your family’s life. It’s time to talk with a Realtor and a lender. 2019 is the year you make homeownership happen. *This analogy isn’t originally mine, but I love it. Learn more about the steps it takes to buy your first home at my FIRST TIME BUYER CLASS. Saturday March 2nd, 10 am to 12 pm. At Inhabit Real Estate, 3121 SE Division St. Portland OR 97202.